"As the seasons change, what pieces and fabrics are a 'must store' until next fall/winter, and what can remain through spring?" STORE winter coats. Yes, it's still pretty cold when you leave the house, but it will warm up significantly during the day, so light layering is key. But, I think you can say goodbye to the bulky wool coats and free up a lot of closet space! KEEP lighter jackets (even leather), blazers, and cozy cardigans. They are perfect to throw on over spring skirts and dresses. 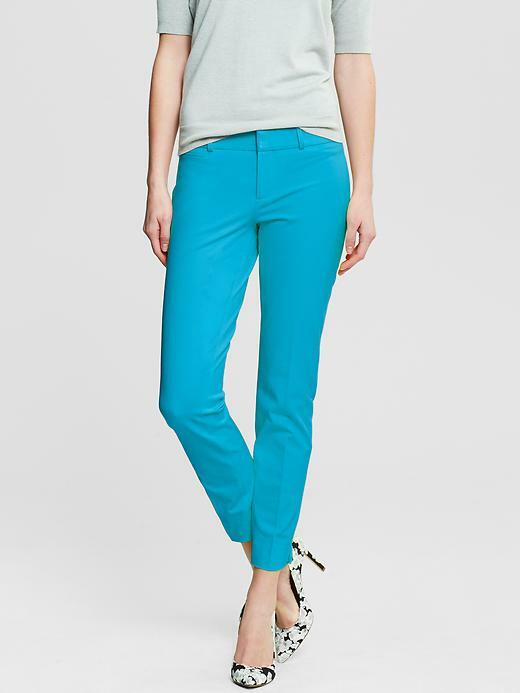 KEEP lightweight pants (silk, cotton, rayon blend). Your legs will still be covered, but with a lot less bulk. STORE bulky scarves. Cozy, fuzzy, big, warm scarves are so wonderful in the winter, but I think we're all ready to bid them a fond farewell! KEEP lightweight scarves. I wear scarves Fall through Spring. I just choose lighter fabrics and fun spring patterns at this point in the year. They add an element of style to your outfit, and they'll keep you plenty warm during this transition. STORE tall boots. I admit, I've worn these as recently as…well, this morning. But it's time to part ways with tall boots, especially if they're black. Pull them out again in late-September (when it's still hot as Hades, but we're all anxious to get back into our fall wardrobe)! KEEP ankle boots. My feet aren't ready for full exposure. That fact, coupled with my love of ankle boots, means I'll keep wearing them with spring dresses, jeans, and midi-skirts (carefully) until the feet ask for sandals. There are also some cool sandal/bootie "hybrids" (see picture above) that would make the transition easy! STORE dark colors. No, you don't have to store everything dark! I'm a huge fan of an all black look, even in the Spring. But, as we're making this transition, it might lift your spirits a bit to ditch the black sweater or jacket in favor of something bright or pastel. Wear your winter-staple jeans, but put on a floaty pastel top to lighten it up a bit. KEEP lighter colors. Explained above, but I'll add that even on a day when you may need a slightly heavier material for warmth, you should choose something in a lighter color to read less "stuck in winter." Keep out a cashmere sweater or two, but no gray or black! Alison, I hope this has answered your question! Everyone else, please send your questions my way anytime!